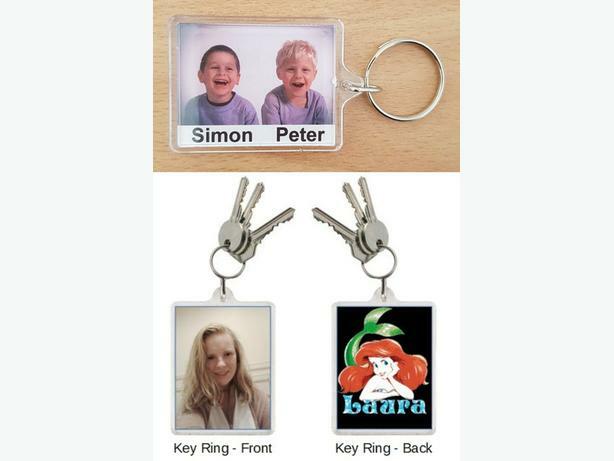  Log In needed £5 · Two personalised key rings with your own photos. Two personalised key rings with your own photos. Double sided keyrings. Just send your photos to my dedicated email address. See picture examples, I can add any text or graphic required. 2 Clear acrylic perspex Keyrings. 230 GSM Gloss Photo Paper (photo will be sized to 45mm x 35mm). 6 colour Photographic printing on Canon (inkjet) Printer. The blank key rings come to us bulk packed and sometimes the metal key ring rubs against the perspex plastic during transit. Therefore small scratches are unavoidable. Also, the colour photos are glue into the keyring, and sometimes the clear glue can be visible under the microscope! Can also supply 4 passport size photos printed on 230 GSM Gloss Photo Paper at a cost of £3 (if ordered at the same time). That's cheaper than at the photo booths! Postage & Packaging costs £3. The keyrings have to be posted Large Letter because of the thickness (1.1 cm). Royal Mail (Large Letter) Signed For 2nd class. Delivered within 3 days.